Liverpool sits on the eastern side of The Mersey River and is probably one of the most famous cities in the North of England. Having recently been the European City Of Culture, the residents have taken the lead in making their homes sleek and modern by installing plantation shutters to their windows. Only 20 miles north of Merseyside, Southport is a perfect base for exploring the north west of England. England’s classic resort of Southport is the local holiday destination of neighbouring Preston and Liverpool. Renowned for its beautiful sandy beaches the seaside town’s Victorian properties are ideal to have interior shutters. The old Victorian houses, built with large sturdy sash windows are great for installing perfect shutters. Our featured photo shows full height bedroom shutters with a mid rail in the centre section allowing you to move and adjust the louvres separately at the top and bottom. This gives you more flexibility in adjusting light and privacy. These Southport wooden shutters have our cloudy white paint finish from our standard range and have 6 panels, 3 hinged opening to the left and 3 opening to the right, so the panels can fold back fully against the side walls. 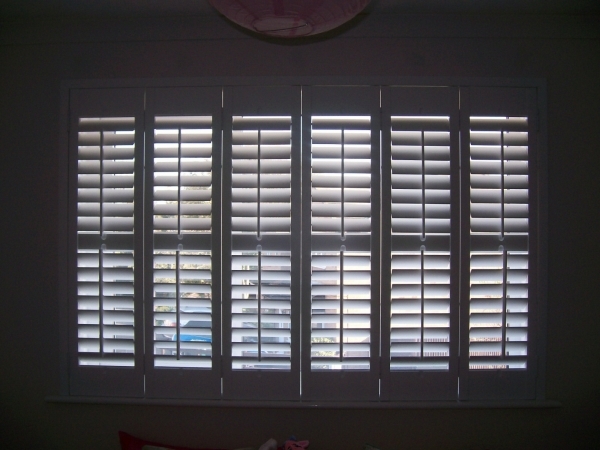 You may wish to view another example, this time interior bedroom shutters. Plantation shutters in a bedroom are the perfect window covering. The shutter panels can be opened back fully to allow in as much light as possible when the room is not being used. Alternately, the panels can be closed to the window and the shutters louvres adjusted to maximise light and privacy when the room is being occupied. At night the louvres are simply closed shut to give privacy. I want to make sure that I get the right window covers. It’s great that plantation shutters can be so good at controlling light levels! They would make it so easy to control glare when trying to watch a movie or something. That’s definitely worth looking into.